Why did we want to stop at Gibraltar? I am not sure I have a good answer for that question. It’s an odd place, a little bit of Britain stuck on the bottom of Spain like a piece of chewing gum stuck to its shoe. It is home to the only wild monkeys in the continent of Europe, and who doesn’t like to look at monkeys, so that’s as good a reason as any to visit. There’s a Marks & Spencer and Morrisons grocery store, so there was the chance to stock up on underwear and some British food faves like scotch eggs and Branston pickle, there’s another reason. Plus there’s just the curiosity value alone - we were right there it seemed worth a stop. Gibraltar (aka Gib) is a tiny (2.6 square miles) British Overseas Territory. This apparently means it is not part of the UK, but under its jurisdiction. It does mean they speak English, spend pounds, have red telephone boxes and, as I mentioned, have a Marks & Spencer. The Spanish lay claim to it and I won’t go into the detail (you can Google it if you care) but I learned on this visit that Spain has a couple of similar disputed territories in Northern Africa on the other side of the strait that it is also not keen on giving back to the Moroccans. Given my new knowledge, I am not sure Spain’s argument over claiming the area can be had with a straight face. We parked on the Spanish side of the border where there is a great facility for motorhomes at La Linea de la Concepcion. From that side of the border we could see the famous Rock, well you can hardly miss it, it is gigantic. The border is walking distance from where we parked and you’ll need your passport of course to enter. Once through Spanish & British passport control you encounter the first strange thing about Gibraltar. The main road into town crosses the runway of the airport. When a place lands or takes off, as when we entered, the gates come down and you have to wait. Once they open again you walk right across the runway to get into town. Weird! As our first full day there was a Sunday we thought we would see if we could score a traditional Sunday roast dinner. We found a fantastic little restaurant right on the marina that served us a cracking roast, complete with Yorkshire Puddings and gravy. Magic! We spent the rest of the afternoon wandering around the center, saving our trip up the rock for the next day. The city center is not much to look at, kind of like a typical British town. Much of the building dates from the 70’s and 80’s so the whole place looks like sunnier version of Slough, or maybe to be kinder, Stevenage. The following day we decided to explore the Rock. It’s possible to take a cable car up there, but after reading other people’s experiences we opted to take a taxi tour from Casemates Square. You normally share your ride with other tourists to bring the price per person down but, since no-one else was around, the driver offered us the shared rate. Our driver was very knowledgeable and during our almost three hour tour he gave us a lot of information about this odd little part of the world. The views from the Rock are stunning, it was a pretty clear day and the views over to Africa were fantastic. The monkeys were also entertaining, there are 250 to 300 Barbary “apes” that live on the Rock in five different troops. They have lived there continually for hundreds of years. They aren’t aggressive but do like stealing things and if they discover they can’t eat what they pilfer they’ll discard it over the edge of the Rock never to be seen again. We held on tightly to everything! While the monkeys are the main attraction on the rock, there are also some cool places to explore inside the rock. St Michael’s Cave is a natural phenomenon that has been colorfully lit and today is used as a venue for musical concerts and events. 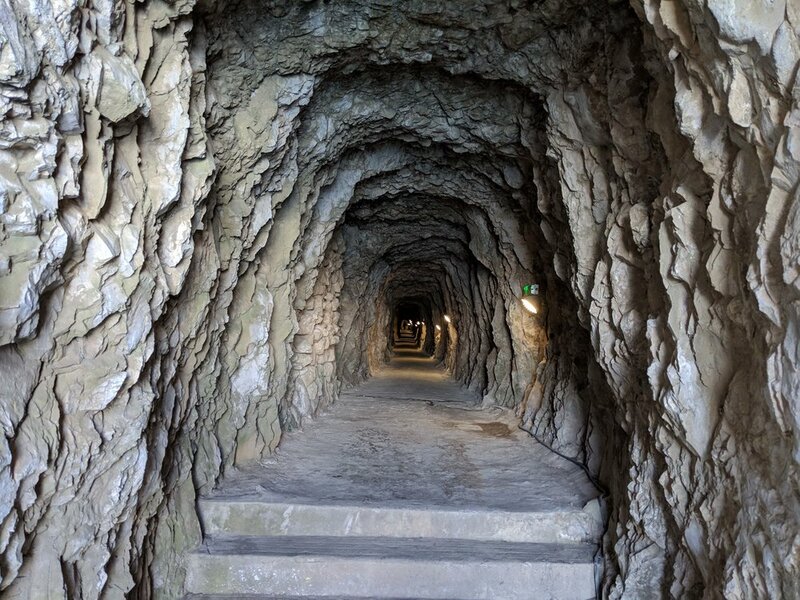 The military tunnels, however, are man-made. Around 34 miles were built by the British Army over the years; twice the length of the road network. It is astonishing when you explore deep into the rock to realize the gigantic structure is like a piece of Swiss cheese with holes running all through it. We really enjoyed our tour, our driver was extremely knowledgeable albeit very opinionated. He told us how many of the locals hated the Spanish and couldn’t wait until Brexit when they could replace the EU flag with the Commonwealth one. He also really loved the Queen, with a fervor I have rarely seen! We came away thinking - wow it’s surprising that the Gibraltarians would be in favor of Brexit when they are literally dangling off the edge of the European continent. A bit of googling enlightened us that in fact 96% of the population in Gibraltar actually voted to remain in the EU. Only around 800 people shared the view of our taxi driver that they should leave. You would think with our worldwide travel experience we would have learned not to trust the opinions of taxi drivers. Overall we did have a fun few days in Gibraltar. It is a very strange place; the monkeys and tunnels were cool, the Yorkshire puddings were great and the novelty value made it a worthwhile place to stop. We never did find any Scotch Eggs though!